Artists: they can all be a bit wacky at the best times. If they’re not cutting off their ears, they’re cutting cows in half with chainsaws (don’t panic, the cow was dead first). But there are some artists who go further even than that. With the popularity of shock art and sensationalist art, particularly in the media, nothing is off limits. And that includes blood, urine, excrement, and the rest. Piero Manzoni was renowned for being a bit of a trickster—not just in life, but in death as well. 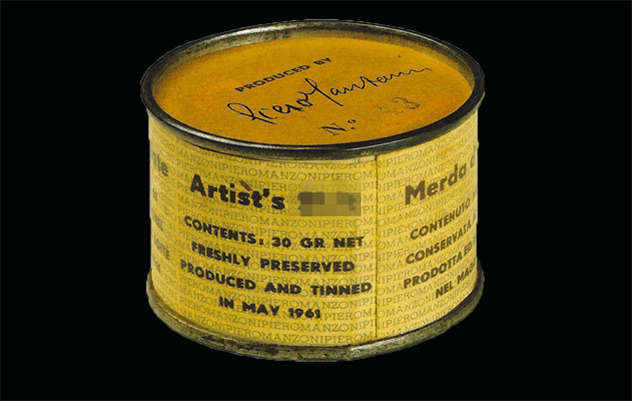 When the Italian died at the tragic age of 29, the conceptual artist had prepared one last laugh for the art market: he filled no less than 90 tin cans with his own excrement. The 30-gram cans were labeled “Merda d’artista,” or “The Artist’s S–t,” and each can was valued at its weight in gold (about $37 in 1961) and set to fluctuate according to the market. In 2008, Can 084 was sold at auction for £97,250 ($150,000). Since the cans have never been opened, we know that final joke remains in store for the first person brave enough to actually open one up and reveal what’s inside. Manzoni’s feces—or something more? Andres Serano’s 1987 photograph Piss Christ depicts a small plastic crucifix, including Jesus, drowning in a glass of amber liquid that just happens to be the artist’s urine. The photograph is part of a series: Serano submerged several classical statuettes in various liquids, from milk to blood. 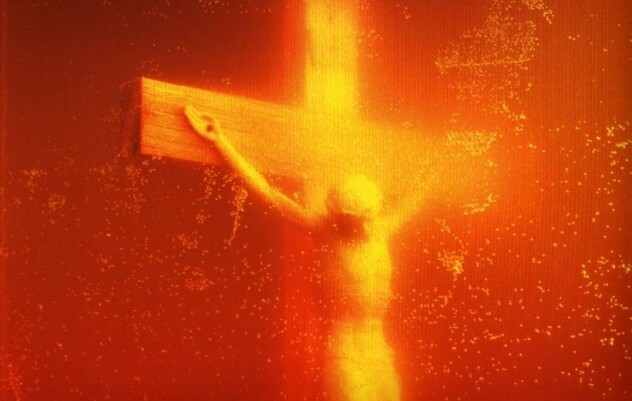 Serano has been accused of cheapening Christianity, but the American artist has always asserted that Piss Christ is itself a commentary on the cheapening and commercialization of Christian icons in the modern age. Self portraits have been around in the world since the first caveman picked up a piece of flint and starting doodling penises on a rock wall, but Mark Quinn took this age-old tradition and added a quirky, and slightly disturbing, twist: Quinn creates a bust of his head every five years using his own frozen blood. 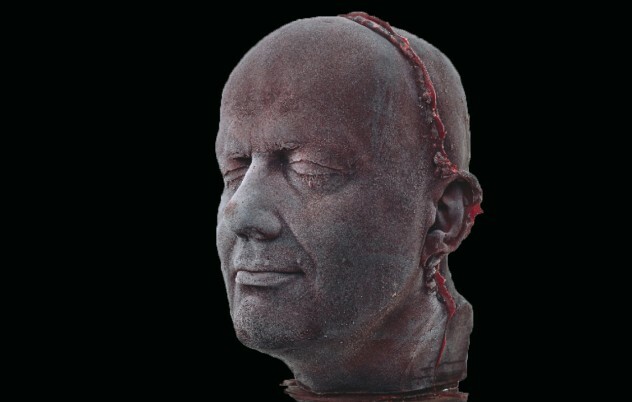 Each cast take 4.5 liters (1.1 gallons), which are drained from his body over five months before being frozen into a mold. Media artists Daniela Kostova and Olivia Robinson have harnessed bodily fluid for the betterment of mankind by inventing sweat batteries. Kostova and Robinson used the sweat they harvested from volunteers wearing special suits to power a world map made up of LED bulbs called Waste to Work: Everyman’s Source. The artwork not only includes the map, but also a video of the sweat being collected and a display of the sweat batteries themselves. 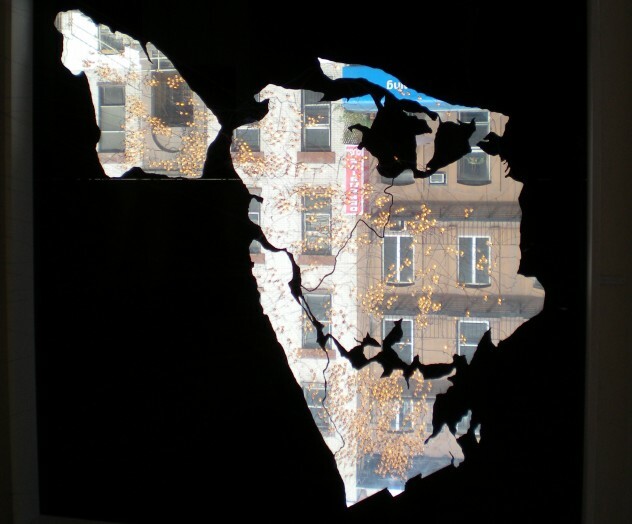 The artists have since gone on to create similar works, one of which depicted anxiety levels in New York City using data collected from the New York State Labor Department. 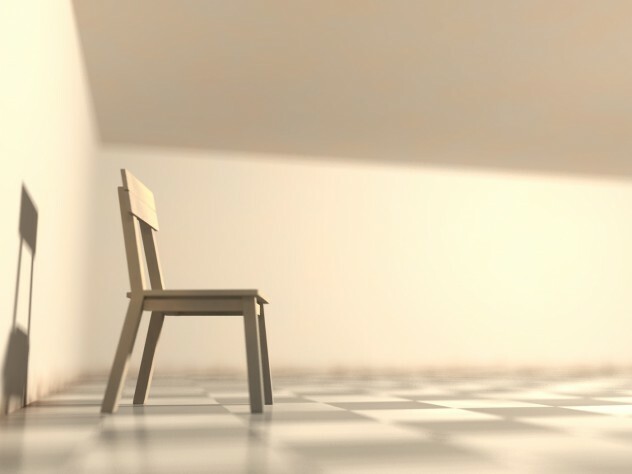 Their art explores the relationship between work, sweat, pay, and unemployment. In the short life of Helen Chadwick she created some of the most eye-catching and thought-provoking British art of the last century. One of her notable pieces is Piss Flowers: 12 white-enameled bronze casts made from holes she and her husband urinated into the snow. The flowers are perhaps most arresting for their gender-inverting quality: Helen’s sculptures are the more phallic of the two. In her artwork Nexus Vomitus, artist Millie Brown collaborated with opera singers Patricia Hammond and Zita Syme to create a 30-minute vomit and music performance piece. In it, operatic singing plays in the background while Brown swallows milk dyed with food coloring and self-induces vomiting to create a splattered rainbow on canvas. Brown reprised this performance in a Lady Gaga video. 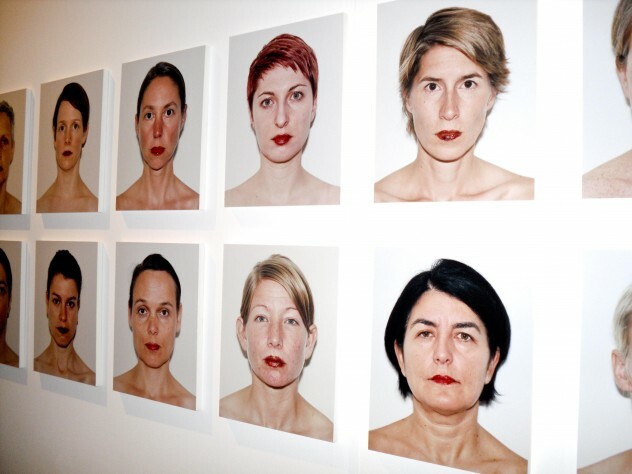 That’s not lipstick on the lips of those women in Ingrid Berthon-Moine’s photographs—it’s menstrual blood. Each photograph comes complete with a euphemistic play on generic lipstick names, like “Rouge Pur” or “Forbidden Red.” Believe it or not, Berthon-Moine was still in school in 2009 when she created Red is the Color. Let’s not get into the debate of whether or not body fat counts as bodily fluid—when an artist goes to all the trouble of having his own body fat sucked out to be used in a piece of art, it counts. Chilean-born artist Marco Evaristti invited some friends over for dinner and surprised them with his latest art project: meatballs made from beef and his own body fat. 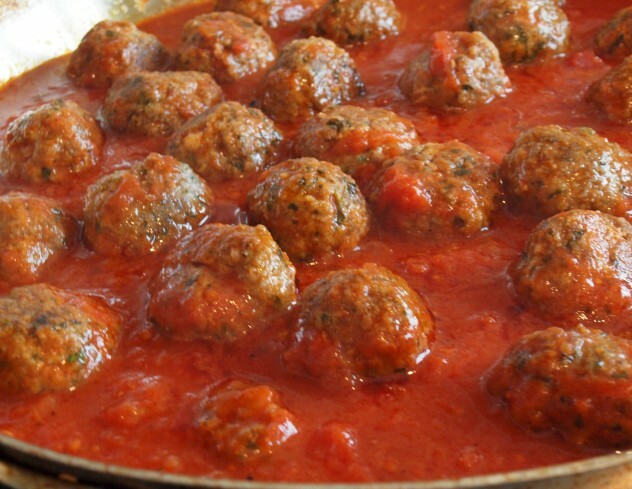 Evaristti also displayed his meatballs in a public gallery as 13 tins on a long table. Evaristti says his meatballs are no more disgusting than the meatballs found in the supermarket and that the artwork provokes a discussion about the cyclical nature of eating, consumption, and health care intervention. Andy Warhol was courting controversy right up until his death in 1987, at the relatively young age of 58. In the last decade of his life, Warhol created a series of artworks in collaboration with Victor Hugo. 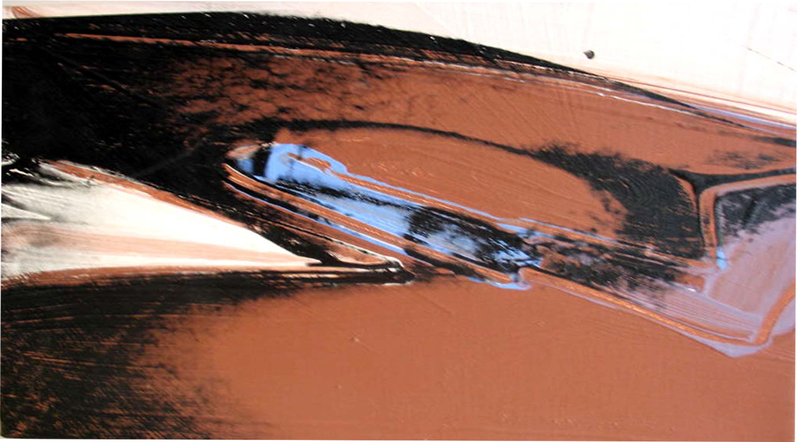 But this wasn’t your standard collaboration: Hugo was being paid by Warhol to arrive at his studio, drop his trousers, and urinate on canvases that Warhol had already prepped with copper-based paint. The reaction between the acidic urine and the copper created a vibrant mix of yellow, oranges, and greens. The Homecoming of Navel Strings is an installation by Noritoshi Hirakawa that shocked onlookers at the 2004 London Frieze Art Fair, and has continued to do so wherever it has since been installed. Homecoming features a young woman reading a Philip Pullman novel next to a pile of human waste—a pile which reappears, fresh and solid, each and every morning of the six-day event. Capping off the piece was a magenta painting of a human sphincter. Who says art fairs are boring? Gareth May is an author and the co-editor of relationship website His 'n' Hers Handbook. His debut book, 150 Things Every Man Should Know, published in November 2009, was selected as one of the best books of the year by The Independent on Sunday. It has been published in the USA, Russia and China. His second book, Man of the World, was published in June, 2012. Born and bred in Devon, he now lives in London.